Statewide Security offers different levels of service all of which are professional delivered and are tailored to fit your specific needs and all our clients are provided with roving field supervisors on all shifts. Our supervisors will periodically check on officers making sure you receive top notch services at no cost to you. 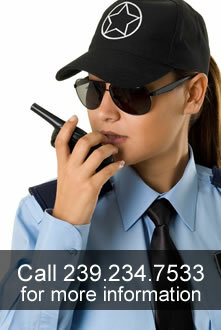 Statewide Security Enforcement & Investigations Inc. offers Fire Watch protection services. Fire alarms or sprinkler system out of service? We have been providing fire watch services for our current clients for years, now we offer this important service to everyone!!! We provide licensed security officers for fire watch on your property. Short notice, long term no problem whether you need a vehicle or just the guard, call us today at 239.234.7533.